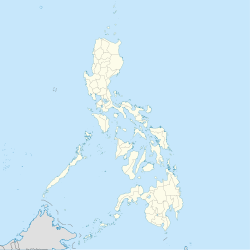 Sumisip, officially the Municipality of Sumisip, (Tausūg: Lupah Sumisip; Chavacano: Municipalidad de Sumisip; Tagalog: Bayan ng Sumisip), is a 1st class municipality in the province of Basilan, Philippines. According to the 2015 census, it has a population of 41,730 people. 12 barangays that were not on Basilan Island seceded to form the municipality of Tabuan-Lasa through Muslim Mindanao Autonomy Act No. 187, which was subsequently ratified in a plebiscite held on March 29, 2008. Sumisip is politically subdivided into 29 barangays. In the 2015 census, Sumisip had a population of 41,730. ^ "Province: Basilan". PSGC Interactive. Quezon City, Philippines: Philippine Statistics Authority. Retrieved 12 November 2016. ^ a b c d e Census of Population (2015). "ARMM – Autonomous Region in Muslim Mindanao". Total Population by Province, City, Municipality and Barangay. PSA. Retrieved 20 June 2016. ^ "Muslim Mindanao Autonomy Act No. 187; An Act Creating the Municipality of Tabuan Lasa in the Province of Basilan and for Other Purposes" (PDF). Regional Legislative Assembly ARMM Official Site. Cotabato City, Philippines. July 2007. Archived from the original (PDF) on 4 February 2016. Retrieved 10 November 2016. ^ "Municipal: Sumisip, Basilan". PSGC Interactive. Quezon City, Philippines: Philippine Statistics Authority. Retrieved 8 January 2016. ^ "Province of Basilan". Municipality Population Data. Local Water Utilities Administration Research Division. Retrieved 17 December 2016. ^ "Sumisip, Basilan : Average Temperatures and Rainfall". Meteoblue. Retrieved 29 January 2019. This page was last edited on 24 February 2019, at 10:51 (UTC).